I had a couple of slices of this for my breakfast, this morning and it was spot on. Add 1kg white bread flour, 3 teaspoons of salt and 2 free range eggs. Beat in the mixer at speed setting 1 until all is incorporated,then reduce down to the “min” setting – until the dough looks smooth, which will take approx 4 minutes or so. Stop the mixer and scrape the dough off the hook every now and then with a RUBBER spatula, if the dough hook should get all clogged up. You want a fairly wet dough, as the fruit added later will absorb some of the moisture. If the mixture looks very wet, add more flour; if too dry, add more milk. Turn out the dough onto a oiled work top and flatten out into a rough rectangle, sprinkle a handful of dried fruit over the dough rectangle then fold into 3, cut dough in half, add more fruit and place one half on top of the other, repeat 4 times. I tend to use about 250g of fruit. Finally, cut dough in half, then flatten each half into a rectangle and roll up the dough into a sausage shape, tuck the ends in. Pop each of them into a 500g loaf tin. 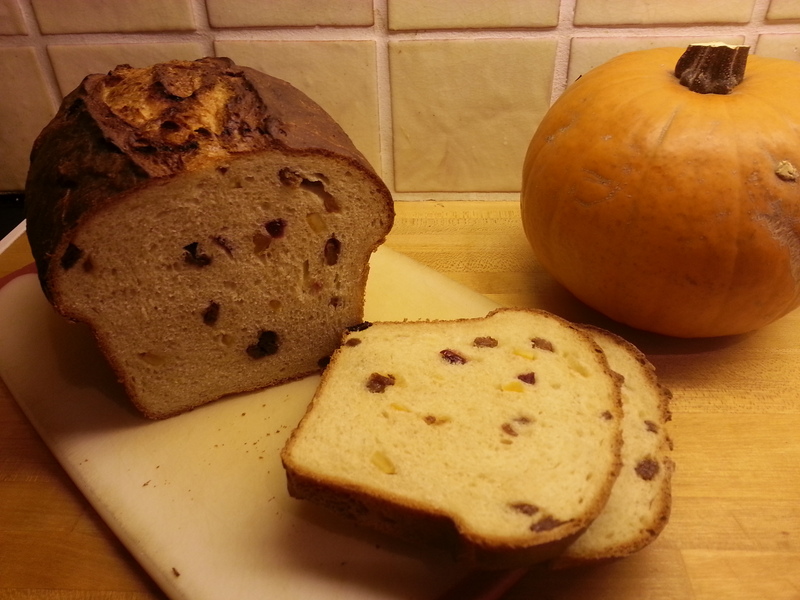 Being sure to pick off any fruit from the top of each loaf as it will burn in the oven. Cover the tins with an upside down clean carrier bag and let the dough prove in a warm place for 1/2 hr to 45 minutes. Meanwhile Turn on the oven to 200c and pop a roasting tin in the bottom of the oven. Pour a cup of water into the roasting tin and shut the door quickly and gently. Set timer for 1/2 hour. When baked and sounding hollow when tapped, remove from oven, pick off any burnt fruit (!!) and leave to cool on wire racks. Eat with lots of butter. Tip. If using a fan oven, turn the oven off before opening the door otherwise all the lovely steam and heat will be blown out by the fan. Alright, so maybe this review doesn’t appear precisely where I said it would, that could be due to spooky Halloween based spectral tomfoolery – but more likely is due to sheer ineptness on my part. B&T seem to specialise in very good food, jovial staff and a decent range of beers and cocktails…so Eve and I will be visiting them again, no worries. Anyway onto the Bath SPA – which, at a glance, could be mistaken for the actual Roman baths in Bath. 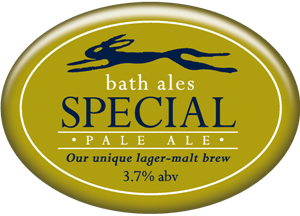 SPA actually stands for Special Pale Ale…so there you go. It arrived via a jovial chap – who I think was the manager – and was all lagery-yellow (the beer, I mean. Stop it.) SPA sports a sticky, lacy head and looks not unlike a pint of Boddingtons, although maybe a smidge darker. The aroma was all malty with hints of autumn fruitiness; a honeyed biscuity caramel theme also wove through that suggested a much darker beer than SPA actually is. There wasn’t a lot in the way of hop aroma, and certainly nothing that especially poked me in the eye. The taste made me think that there was biscuit malt in there somewhere (I since discover – by reading their webpage that it’s made with lager malt and wheat!) SPA continued to surprise by being both sweetish and dryish with a very faint sour tang. There was also enjoyable creamy, almost dairyish notes that reminded me, for some reason, of malted milk biscuits. There wasn’t much of an aftertaste or even really any bitterness, the whole thing being over and done very quickly…but it was different enough to be enjoyable and an interesting diversion. When he went away the blues walked in and met me. If he stays away old rockin’ chair will get me. Just like Billie Holliday when she chirped out this catchy little upbeat number, we in the UK have been suffering from stormy weather. Most of us got through it OK, and even more of us -unlike dear old Billie- were lucky enough not to be under threat of imminent attack by the furniture. Anyway, whilst rummaging about in the cupboard for something to drink I came across a bottle of Adnams Lighthouse – which seemed extraordinarily apposite given all this storm-based hoopla we’ve all just experienced. Lighthouse is indeed a guiding light for us all, and a lesson in how to make a small beer big. At 3.4%, Lighthouse is definitely on the low ABV side, but Adnams have woven their magic yet again to make something that feels a whole lot bigger. Appearing in the glass as a light polished copper colour, Lighthouse held up a head that quickly fell back to a slick sea-foam covering. The aroma was of honeyed golden maltiness and minerality. Light and fresh smelling, like a bracing walk on the beach. The body of Lighthouse was good and thick, I’m guessing generous dextrins helped out a lot here…maybe they mashed just that little bit higher to encourage the cheeky blighters? Maltiness abounds in the taste accompanied by a delicate, light hoppiness. The after-taste was long and elegantly bitter with resiny, piney hops in the mix. 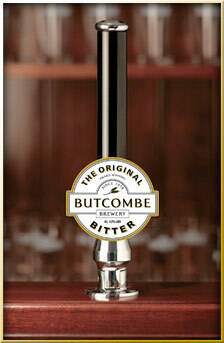 Ah, a beer from Bristol…or Bristle as it’s inhabits pronounce it. I don’t know of that many other beers and breweries from Bristol – apart from Bath Ales (which you’d imagine were in Bath, but there you go…) in fact I’ll be reviewing one of their beers in the next post, so you’d better keep reading, hadn’t you? The first thing I noticed upon tasting was the sumptuous mouth-feel, a thick mouth-feel that belies the 4% ABV – it just feels like a much bigger beer. The taste was also big: mouth filling malts and a long, satisfying bitterness. The aftertaste went on and on….which as we all know is the hallmark of a decent beer. A beer on tap in The Black Prince in Woodstock purporting to be an American Style Pale Ale and claiming to be three-times hopped with Citra, Simcoe and Amarillo? That I just had to try…I mean why wouldn’t I? The aroma certainly didn’t bowl me over, I was expecting something fairly pungent: citrusy, resiny and maybe just a bit orangey…but didn’t get it. I mean it smelt good enough – a vague vegetal hoppiness, but there’s no way that I should have been able to smell the maltiness over the hops…not in a US style Pale Ale that’s apparently been hopped three times! 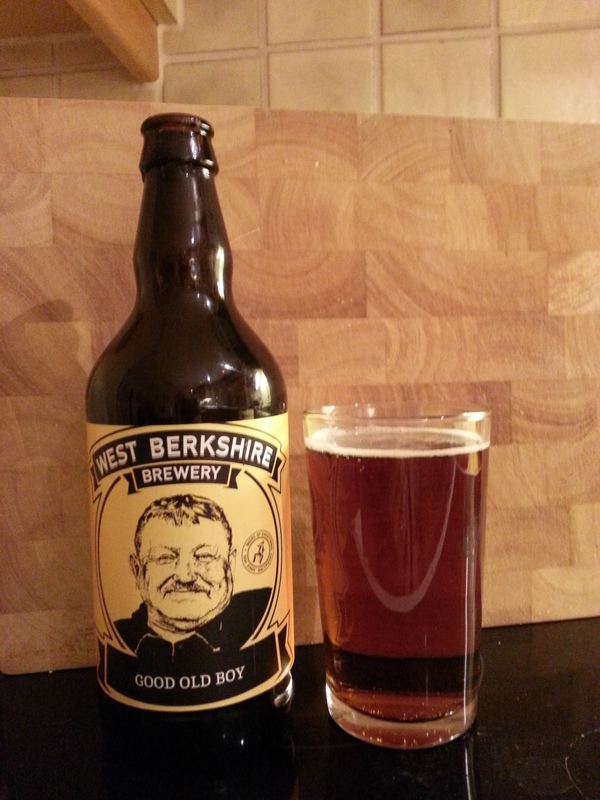 Fortunately the taste came to the rescue; being all thick malty and sweet with a bristling hogs back of bitterness. Hop taste evident was not huge, but resiny, vegetal and lightly mouth-coating. The bitterness hung about quite a while in the aftertaste and there was definitely a theme of hoppiness there, too. Patriot is almost there as an American IPA but needs to be a bit more pumped up, if a beer claims to be an American style Pale Ale then it’s got to walk the walk these days, and not just talk the talk. Ah, Berkshire. It’s the next county along to Oxfordshire, you know…and guess what, we share a common dialect too. “My Old Boy” is also what my Dad refers to me as, when talking to other people. Mind you, I refer to him as “My Old Man“. Other people’s Dad’s can be referred to as “Your Old Boy“. It’s a confusing business living in this neck of the woods, but we get by. Nose-wise I get nice malt and minerals, some warm woody notes and faint berry fruits, a very clean and uncomplicated aroma. 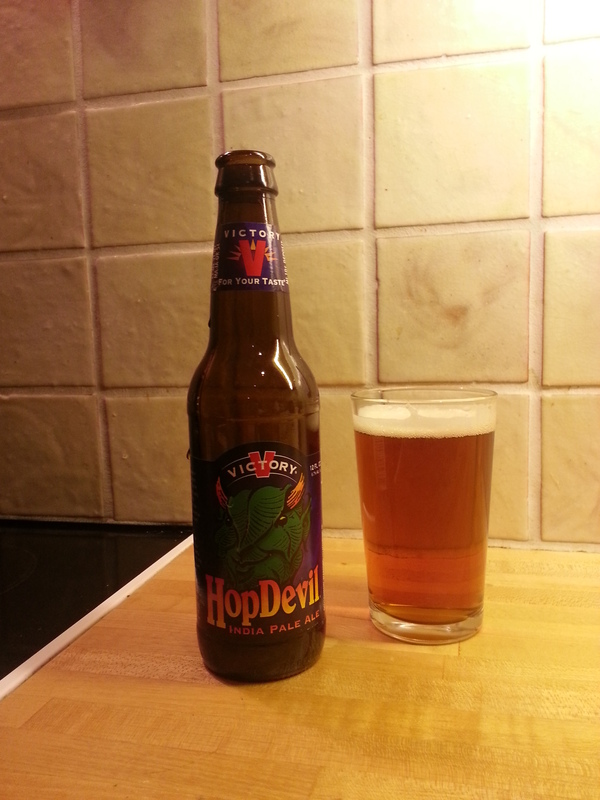 Anyway…reading about crackers-strength American beers made me want to drink something like that, and then I remembered that I had a bottle of Victory Hop Devil that I brought back with me from my recent trip over the water. The bottled version of Hop Devil arrived into a glass bearing that familiar IPA orange hue. The head was sticky, lacey and long-lasting. As per the draught version, there wasn’t a gigantic aroma, but it did have lovely resinous pine and some sticky sweet malt. The taste was pleasantly bitter, and teamed up nicely with the hop notes; making for a very joined up experience. The after-taste was a nice enduring resiny bitterness that pervaded for a quite a while. In summary: very mellow, very mild for an IPA. But very nice. I could drink a lot of it.